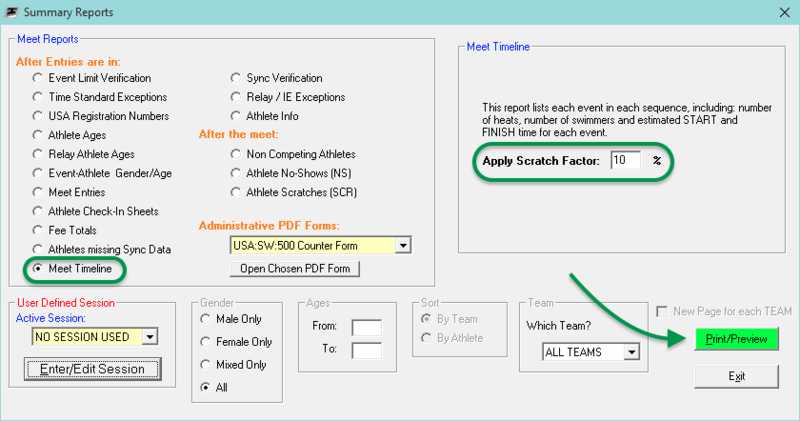 You can get an idea in TouchPad of how long your meet will run with either the Meet Timeline report or Meet Duration report. The former allows you to specify a scratch factor to see what your timeline will look like if you scratch a percentage of the slowest kids. This only applies to unseeded events. The latter allows you to specify an event range. Otherwise they are identical. If the timeline is too long for a given session, use the Apply Scratch Factor to unseeded events to view how much the timeline will change. Select Meet Timeline on left. Enter a scratch factor percentage on the right. Select any other desired options. The Number in Event column will show (sf) by it to indicate it’s a scratch factor. The number represents the number of swimmers remaining after scratching the slowest ones by the percentage entered, and the start and finish times reflect those numbers as well. This only applies to unseeded events. Select Meet Duration on the left. Select your Active Session if desired (your timeline will base its calculations off of your sequence setup), or enter an event number range on the right.